Popular, sports-centric stand-up comedian, Von Decarlo, joined the ranks of exciting, original programming on SiriusXM when she premiered her brand-new weekly show, Coach Von’s Corner, on the NBA Radio channel Sirius 207 XM 86, October 17, 2018, and became not only the first comedian to have her own show on the channel, but also, the first woman. The charming yet irreverent New Yorker is very excited to combine her love of the game with her gift of comedic gab and no-holds-barred, real talk welcoming the best and the brightest comedians pulled from Von’s personal, celebrity rolodex. “Coach Von’s Corner is an extension of my podcast, Coach Von Podcast, and will be an enjoyable, well-rounded digital media show where you get uncencored, exclusive discussions from myself and my comedian guests, about an array of topics” says Von Decarlo. “It is also very important to me to create a show that is a fun, safe environment for NBA players to come in and talk about all of their off the court endeavors, because as so many have proved, they are much more than “shut up and dribble”. Donnell Rawlings and Bill Burr were the first guest on the Sirius XM launch on October 17. Von Decarlo is a multi-talented stand-up comedian, actress, and author of the book, Speak Fluent Man. 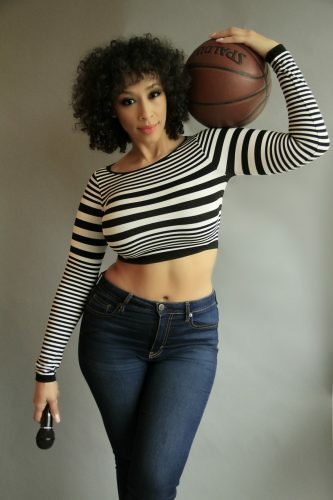 An avid sports lover, Von Decarlo grew her fan base with a sketch comedy web series and blog called, Trash Talk with Von Decarlo, in which she tackled pop culture, sports and relationships in a fun, yet informative way. From the popularity of the show, as well as her growing social media following, fans began to call her “Coach Von” in relationships and sports. She started to make regular appearances on television and radio as a life coach, and became a mainstay on SiriusXM NBA Radio, as well as, SiriusXM Urban View. She completed two seasons as a talking head comedian on BET/Centric’s relationship-based show, According To Him + Her, and is featured on Tru-TV’s hit comedy show, Laff Mobb’s Laff Tracks. In addition, she performed at the Just For Laughs Comedy Festival in Montreal for Kevin Hart’s LOLNetwork, JFL Present’s LOL Live. You can also catch her in commercials for Disney’s Aladdin, Carnival Cruise Lines, and on the CNN’s year end wrap up special, All the Best/All the Worst 2018. Von Decarlo’s podcast, Coach Von Podcast, uses sports to anchor into fun, yet honest, conversations about life, love, and relationships. You can find her performing stand-up comedy at many premier venues throughout New York City, and her one-woman show, Lasagna, debuted at The People’s Improv Theatre to a full crowd and rave reviews. She is a graduate of the UCB improv program, a founding member of the musical improv group, Good Catch Comedy, and a UCB diversity scholarship recipient. Von Decarlo is a double first name, and yes, her mother named her after Lily Munster. By digging deep into topics such as entitlement, double standards, logic vs emotions, and more, Von Decarlo brings to you a very in-depth, personal memoir for both men and women. Don’t let the title fool you! Whether you are male, female, heterosexual, bisexual, transsexual, or transgender, Speak Fluent Man, can help you realize the full potential in any type of relationship, by helping you understand how to have the courage to live in your own truth, and accept the truth of others unconditionally. For more information and for purchase options go to www.SpeakFluentMan.com.